How does Canstar get paid? If you happened to get caught up in the gift-giving spirit this Christmas – and went a little wild on the old credit card – you’re not alone. In the month before Christmas, New Zealanders spent a total of $5.7 billion on their electronic cards, an increase of $252 million (4.6%) compared with November 2017, according to Statistics New Zealand. Just like a champagne-buzz induced hangover – the reality of all this festive spending can be sobering in the light of a new year. In fact, a $3000 credit card debt can lead to many many years of repayments if you don’t get on top of your finances, Canstar research shows. For example, it could take a rewards credit card user a staggering 22 years to pay off a $3000 credit card debt, at the Canstar database’s average interest rate and annual fee, 20.10% and $95.57 respectively, if only minimum monthly repayments were made. This would mean $672.81 of fees and interest over the first 12 months alone. This compares with a 9-years-and-4-months repayment period on a $3000 credit card debt, based on a the average Canstar 5-star low rate card of 13.23%, annual fee of $10 and a $368.55 cost over the first 12 months. These figures assume the credit card user is making minimum repayments – based on the greater of 3% of the outstanding balance or $25. The cost over 12 months also assumes the credit card holder has not made any additional purchases on the credit card. So, what do you do if the reality has set in about your personal credit card debt? One solution to getting on top of credit card debt is a balance transfer. Canstar has crunched some numbers on credit card balance transfers, to help you take a leaf out of Marie Kondo’s book and declutter your finances; we are assuming debt doesn’t spark joy for anyone! A credit card balance transfer is when you transfer part, or all, of an account balance into another account, which is generally held at another institution. In the case of credit cards, you would transfer the credit card balance onto another credit card. A balance transfer means you can move your debt to a zero or low interest credit card for a promotional period. If you’ve got a $3000 debt, with the average annual fee of $48.81, you could repay the credit card debt off in six months if you paid $508.14, or within a year if you paid $254.07 a month. This is based on a 0% interest balance transfer for the period stated, assumes that the average annual fee will be charged but does not include any other potential balance transfer fees. Sounds a lot better than the earlier scenario with higher interest credit cards, right? But what happens if you can’t afford to repay that much a month, say you could only afford to repay $200 per month, for example? Based on a 0% interest balance transfer for the period stated, assumes the average annual fee will be charged. Does not include any potential balance transfer fees that may apply. Amount calculated is to pay off a $3,000 balance in full. You’d have to be prepared to spend at least another five months making repayments. And don’t forget, these figures only take into account the balance you already have on your credit card – so don’t get tempted to make more purchases on this credit card! With some “new year, new me” financial discipline, a balance transfer credit card may just be what you need to get back on track with your money management this year. But don’t get complacent. As generally goes with financial products, there are some finer details to be aware of to prevent you from unknowingly adding to your debt dilemma. After the advertised number of months for balance transfer offers – ranging from six months to life of the balance – all unpaid balances are transferred to the standard credit card interest rate. In the case of balance transfers on credit cards, the rate you go on to after the offer ends is known as the “revert rate”. So, while a 0% initial interest rate seem very enticing, don’t forget to check rates in the long term! As a general rule of thumb, consumers should find out the promotional rate, when the promotion expires, and the rate they will pay after the expiration. 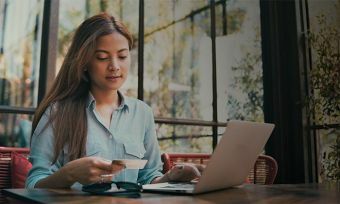 With a balance transfer credit card, most lenders first apply payments to the outstanding balance that has been transferred, rather than the new spending, which attract a higher interest rate. Refraining from spending any money on the new credit card, while you slowly pay off the balance, means you can take advantage of the low balance transfer credit card rate. Only after the pre-existing credit card balance is paid off in full should you put purchases on the new card. There are no loyalty points or interest-free days on the balance transferred. Interest is charged from day one if you make purchases with the balance transfer card. Does your credit card suit your needs? Once you’ve cleared that credit card debt, it’s worth taking a step back and deciding whether a credit card is for you – there are many advantages of having one – and if you have the right type of card to suit your needs. For the 2019 credit cards ratings, Canstar compared 37 credit cards from 11 providers. Canstar researchers compare rates, fees and features, to help you find a credit card to suit your own financial needs. Sign up to receive more news like this straight to your inbox. Could you save with a credit card that suits your spending habits? The material on this website is for information purposes only. Its content is intended to be of a general nature, does not take into account your financial situation or goals, and is not a personalised financial adviser service under the Financial Advisers Act 2008. It is recommended you seek advice from a financial adviser which takes into account your individual circumstances before you acquire a financial product. © Copyright 2016 Canstar New Zealand Ltd Reg. No. 3225469 (FSP200146) All rights reserved.